So you may recall that Microsoft, back in November, acquired FSLogix. I wrote an article about it (that you can read again here) where I speculated as to the reasons behind the company being purchased by the Redmond behemoth. It’s clear that the acquisition is intrinsically tied to Windows Virtual Desktop (WVD), the service that Microsoft have released into Public Preview today (finally!). 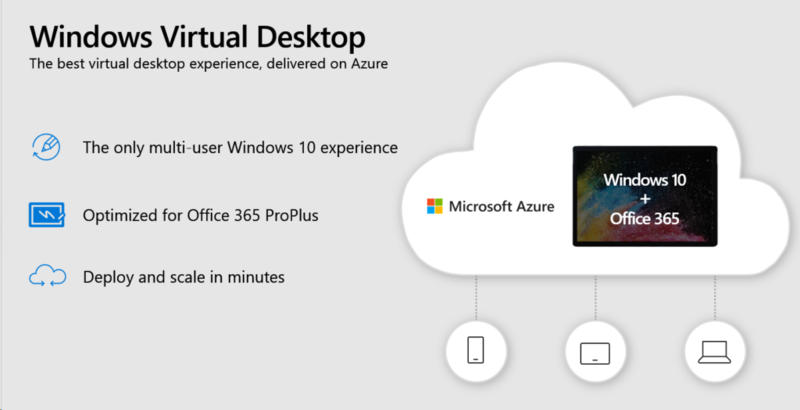 For those of you not in the know, Windows Virtual Desktop is a service that Microsoft are delivering from Azure to run Windows client desktops and applications in the cloud, and it is slated to be generally available in the second half of this year. Some details of the high-level architecture were shared at Ignite (reproduced briefly below), and it operates in pretty much a similar way to the Citrix Cloud offering, with Microsoft handling the infrastructure components. If you meet the licensing requirements (which are pretty loose, and probably cover a huge percentage of customers, read more about them in the release blog at the end), you can run WVD, and because it is now in Public Preview you can start your trials today. But I’m digressing from the point of this article – more details to follow on WVD in a dedicated post. Since then, though, existing and aspirational FSLogix customers, as well as partners and solutions architects, have been left in a form of limbo. Without a clear statement from Microsoft as to how they intend to use the product (because FSLogix was a suite of products beyond just profile management), taking any sort of forward-looking action was difficult. History is littered with products that have simply been left to wither on the vine by companies post-acquisition – whether intentionally or unintentionally. This is HUGE news, IMO. It’s in line with Microsoft’s corporate strategy – they often make bold decisions to take losses to increase their market reach, and this means that a number of customers may take the chance to re-evaluate their third-party commitments, in light of being offered such a suite as this for no extra cost bar that of their already-purchased Microsoft licensing. 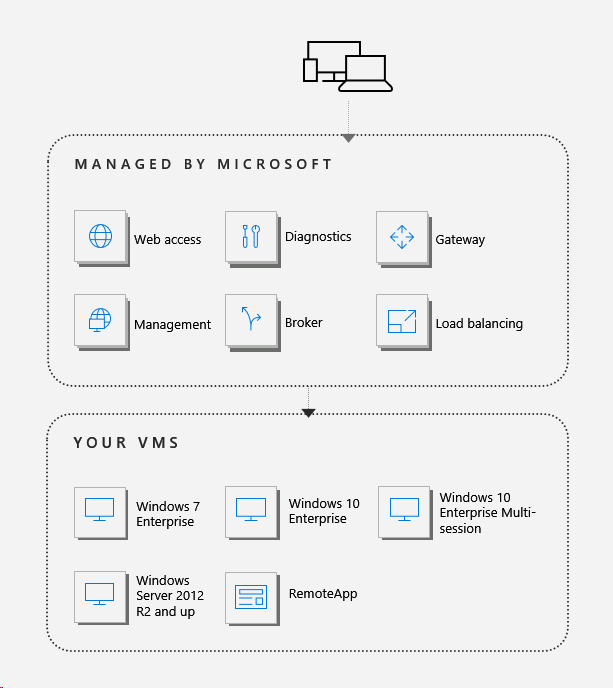 But it also means that moving to WVD, and Azure cloud, is made so much easier as well, by aligning the cloud offering with the on-premises solutions. If scaling out by using WVD just becomes a case of moving images to the cloud where they are managed by exactly the same suite as you use on-premises, then you have a ready-made on-ramp. Microsoft are being very clever here indeed – and let’s not forget, FSLogix is already a pretty “trusted” name in the community, so building upon it in this way can only be a sensible move. The timeline for this, as far as I can tell, is that these new entitlements will take effect sometime between May and August of this year, and a rebranded FSLogix agent will be released alongside the GA announcement of WVD – which may be anytime up until Ignite in September, I would think. There is a lot to absorb about this, especially as a) Microsoft appears very serious about Windows Virtual Desktop, to the extent that they’re prepared to roll the full suite functionality out for no extra cost to solidify a base of users around this, and b) they’re actually listening to the people who are telling them that there are still significant install bases of on-premises customers out there with a need for FSLogix. There are a lot of questions around this as well, though. What will happen to those customers who already have multi-year license agreements for FSLogix? 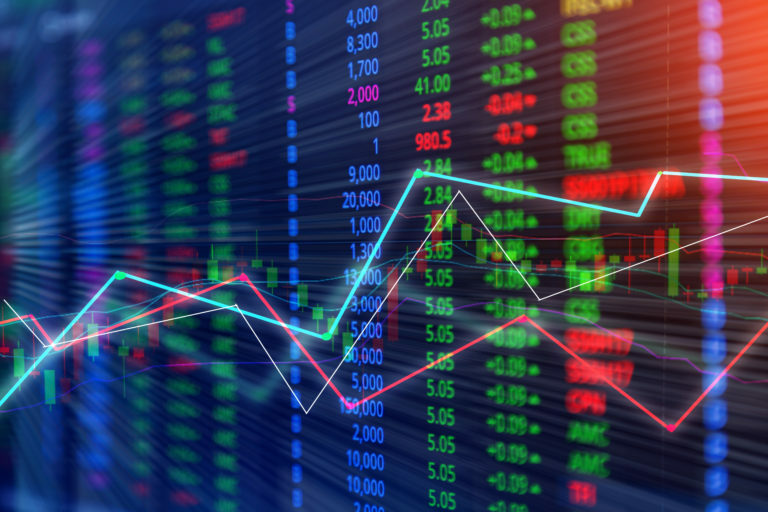 How will the Cloud Cache feature be able to be utilized for customers who have investments in clouds other than Azure? Can we use Azure Storage Accounts or Amazon S3 for storage? Will we be able to use App Masking for licensing compliance for Microsoft software? I’m sure there are many more questions that people can think of – put them in the comments! It’s a thrilling announcement, though, and it fully validates my belief that managing profiles, redirected folders and many other things on a file-by-file basis is as dead as can be. But I must admit, I never expected Microsoft to move like this – I fully expected them to build “UPD 2.0” for their WVD service as part of Office 365, and then abandon the rest of the functionality completely. It feels weird for me to say this, but I like the cut of Microsoft’s gib here. 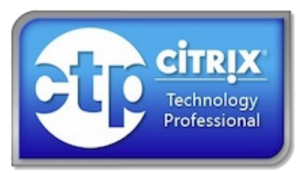 What this means for the rest of the EUC ecosystem, and how they respond – particularly the likes of Citrix and Amazon (there’s a mention of Citrix in the release blog, but nothing concrete as to how they can add value) – remains to be seen. Update – If you want to inquire about whether it is possible to have any form of access to FSLogix in the interim between this announcement and the rebranded release, then I would suggest contacting a partner or one of the FSLogix guys (now at Microsoft) to get further info on what can be done. Happy to help connect people, reach out in the comments if necessary. One question, If Office365 containers is being merged with the Profile Containers, is that not free also if you have the correct licensing? Apologies, O365 feature is *not* going away, I have updated the article to reflect this, apologies for any confusion. Is there a link to MS’s announcement? The blog post you mention? Any VHD solution is hobbled by the need to install bulk storage next to the RDS hosts on-prem to cache all the users Onedrive data and this can be huge. MS are merrily pushing all customers in the direction of Onedrive for user data storage (with no quotaing) and toward O365 PP with E3 licencing so that they pull out all local bulk storage. They then get crippled by the performance of hosting re-directed folders in the cloud. You are then forced at the moment to put all the storage back to cache all of the users Onedrive data because ‘files on demand’ isn’t in Server 2016 and you can’t use server 2019 because you can’t use O365. Don’t start on WVD, because the reason the servers are on-prem is that’s where the latency sensitive legacy apps are. You will have Win10 multi-user for the multi-session scenario, and that appears to be MS idea. Also if your OneDrive is in Azure too, you will be close to the data. FSLogix will no doubt address the problems of Folder Redirection. But if you have workloads on-premises, that will be an issue, if you need the data there too. However the hints that MS may have an Azure Stack or on-premises flavour of WVD coming may address this. It depends on the use case. I haven’t tried the Azure side of things that heavily yet but we will have to see once the new image is ready to go, we use the onedrive mapper currently. I am not sure for us if Azure services like Onedrive are direct connect within the Azure DC or if they have to backhaul over the internet links, due to network design. We have been trailing the Ivanti VHD solution which seems essentially the same as the FSlogix product, it works well and performance is great, it’s just the volume of storage required. I have upwards of 20000 named users on my environment with concurrecy over 3500 a day. the 4000 odd users (the 20000 would need monumental amounts) that have logged on this year would need nearly 30TB of disk in each DC to cache just the onedrive data before I even get to Outlook! I wouldn’t be asking these questions if Files on Demand was in Server 2016. Ivanti solution is not multi-session though, or has it changed? The demos on Win10 multi-user all show files syncing on demand, so that would be the target area I guess. We’ve got the Ivanti solution running in Server 2016 RDS on-prem, in a PoC. It’s new, this version came out early this year. We were going to try FSlogix but Ivanti released their product about a week after we made enquiries and we are already DesktopNow licensed so Ivanti just made sense. We are preparing to deploy it for a limited number of delivery groups, due to the fact we don’t have the bulk storage for the entire estate. MS are maintaining to us that WVD is not going on-prem, but maybe once the EU start looking at them again making Azure only could be seen as anti-trust, so if they have to open it to other clouds on-prem shouldn’t be an issue. Hmmm, product manager’s Twitter timeline seems to be hinting otherwise. We shall see. I’m watching closely (Win10 has the functions I need and I can live with a 20% drop in capacity per server), I may hit up our reps again with his twitter feed and pose the question more directly. Who am I looking for on Twitter? Who was your FSLogix contact for your location? Nigel Woods and Steve Whitfield handle the UK and some of Europe. I think that is the Community Edition you have linked to, which is for 1000 users but non-production only. This is for WVD only and NOT a production release. It is not supported on anything other than WVD. Please contact you FSLogix Partner or FSLogix representative in your country for an evaluation download and license. I cant see anything in the MS announcement on how correctly licensed users with RDS CALs can install FSLogix Profile Containers on premises. How do I obtain a license file? Install the evaluation and contact FSLogix for an extension to cover the interim. Not sure who represents APAC out there, I will find out though. The word is it will be a free download from Microsoft as of June 1st. We got OneDrive in our 2012r2/2016 RDSH environment using the new per-machine sync client (v.19.043.0304.0003 ) to work technically perfectly together with FSlogix O365 container. The only MAJOR problem is that the Files On-Demand feature is missing. The only way we can limit the the amount of data the users syncs is to limit the size of the FSLogix O365 VHDX where the files are stored. Would love to get this feature in RDSH 2012/2016. It seems like the lack of “Windows Cloud Files Filter Driver” (CldFlt) in this versions are the problem. Have not tested with Windows 2019 yet.